First let me share what my 6th/7th grade group did with their Extra Lesson time. They don't get a half day on Tuesdays and Thursdays... they have the mornings with me as well. We did the first question in Joan Westley's EXCELLENT Puddle Questions series (I have books from both the Scientific Thinking series and the Mathematical Thinking series). We used the grade 8 Mathematics book. I highly recommend this series for middle school ages. We also had a ratios mini-lesson featuring Oobleck. I used my Recipes with Wooden Stars technique -- see my previous post to teach the recipe and it worked great. Two red stars and one green. The recipe is two parts cornstarch to one part water. All ingredients at room temperature. Heating it up ruins it. Just mix with a spoon. Precise measuring is key to your success! Oh, this concoction is super-fun and it's great for assessing students' scientific observation. For clean up you MUST use a DRY paper towel. Clean off your hands well with the dry paper towel and throw it in the trash. Scoop the oobleck out of your bowl with a spoon and throw it in the trash. We let our bowls sit outside and get filled with rain by mistake before we washed them and it was easy to wash it. Becca did notice, before it rained, that the stuff outside had dried out and wasn't acting like oobleck any more but if she added water she could revive it. That was a nice review on ratios. If water evaporates out, the proportion isn't kept consistent. Add more water so you get back to that two red stars and one green star... you have oobleck again. Natalie brought this recipe home from her high school science class. Thank you Natalie! If you haven't tried making oobleck at home, go for it! We also did some of the math problems and puzzles from Jamie York's book Making Math Meaningful: Fun with Puzzles, Games, and More!. 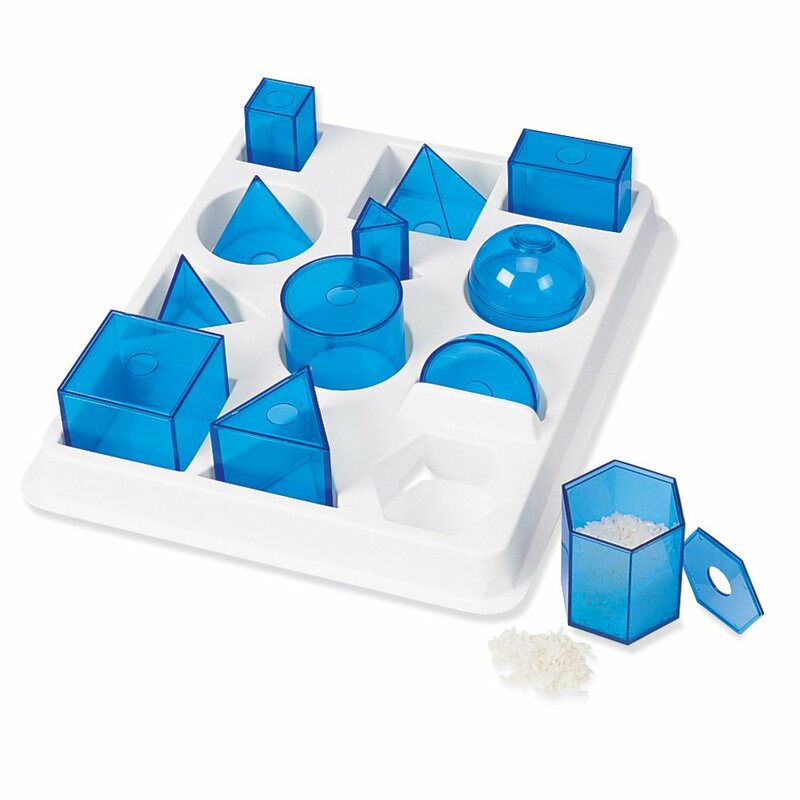 This is a must-purchase if you are teaching middle school or high school math. setting up and choosing birthday ring ornaments for a birthday celebration! 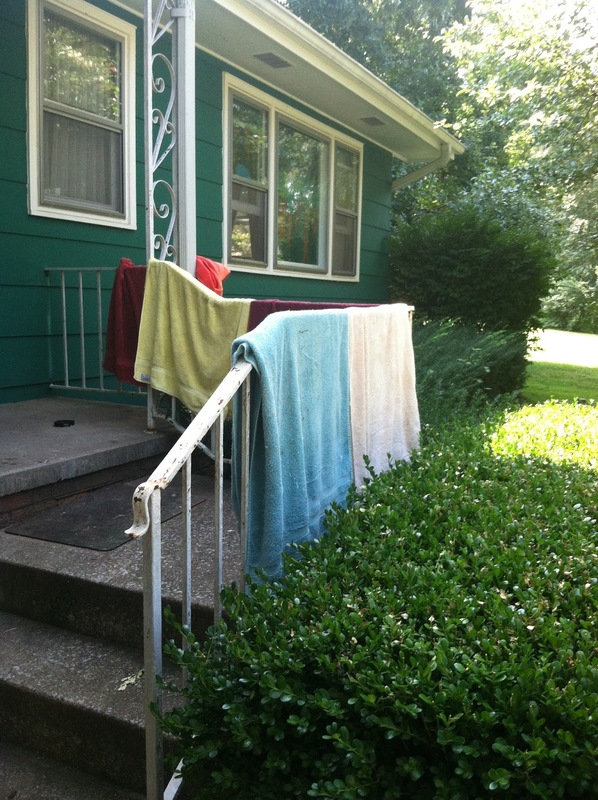 We work outside, set out a bowl of warm soapy water for people to wash their hands off when they are done, and have plenty of towels available. 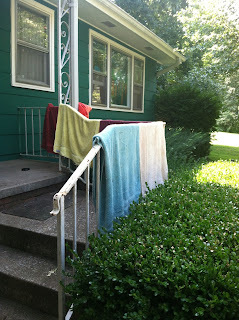 Happily, we lay down bath towels in the grass when we do yoga, as mats, and so these are all already hung over the railing to dry. Thus we have plenty of towels around for clay as well. I love seeing the mixed ages of our group interacting with one another so sweetly, and snapped this great shot of a seventh grader and a two year old washing clay off their hands together. Don't be intimidated by clay. If you have a large bowl, hot water and dish detergent, a bath towel, an old hand towel or dish towel, dental floss, a plate, and a ziploc bag, you can totally do clay. I would recommend not putting self-hardening clay down your sink because it may clog your drain, but if you're willing to wash off outside it's not hard at all. Cut small pieces off with dental floss (loop the waxed floss around the block, grasp the ends, and pull your hands in opposite directions and it will cut the clay and separate it so easily), cover them with a damp cloth when you're not working directly with them, and then wrap the damp cloth all around the clay and put it in a ziploc bag or other airtight container. Don't let it dry out. That's the key. But if it does, you can wet it again. Kind of like oobleck! My book on modeling clay forms, by Hella Loewe, is actually available online for free as a downloadable PDF, courtesy of the Online Waldorf Library; find it here. 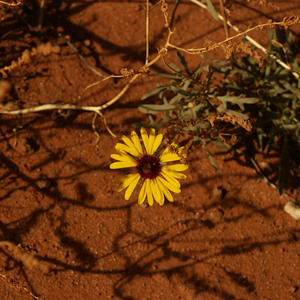 She recommends following clay work with a period of intensive language mental work. Thus we are following clay each Friday with our foreign language offerings, ASL and Spanish, which those parents will be team-teaching, presenting vocabulary in both languages simultaneously. The ASL teacher commented to me that she really appreciated how much the clay had helped the children to warm up their hands! starting a new chapter book to read during snack time, inspired by the interest in one of our students in sharks and fossils! This book was written by a scientist with the National Geological Society in Washington DC who happened to be my neighbor in MD. He's Grumpa in the story. I also know that his publisher, another woman in our community, lost all of her copies of the book when a derecho came through and a tree fell on her house and then the rain destroyed the books. So I am GLAD to have my copy! I bought a large quantity of flattened glass marbles and Leah polished up a beautiful sterling silver platter. We love thinking of our gems as belonging to the cranky little dwarf from Snow-White and Rose-Red, so we are always very careful to lay them out quietly, so he won't realize we are borrowing them to do our math work! To get just the primary crayons in block beeswax crayon form, I recommend A Small Green Footprint. They sell each crayon for $1.65 and will let you get the primary colors without getting a whole tin of the others. Yoga outside on the lawn! Kids have yoga several times a week including Monday, Wednesday (on the Farm), and Friday. Setting up school supplies and learning routines. Getting brand new boxes of colored pencils, plan books, creative writing journals, and daily gratitude journals. Learning how to plan a balanced day and make good choices for little bits of time. Choosing chapter books and picture books to read, getting lessons on educational games, figuring out what color each would be in your plan book. For example, the wooden marble run building set is green for Science and Nature (Physics). It was only after beginning to add finger knitting to our hula hoop loom that I realized that weaving this rug also makes a sun! recall the sun from Red Berry Wool, listen to "The Secret and Magic Name of the King" by Dorothy Harrer, make "one" with our bodies by standing straight and tall, this is the number one and it is also my name, I! I wanted to make sun tea but we ran out of time, so this might be a nice thing to do at home! I'm not doing this but I have a homeschool client who is. I enjoyed putting the booklist together for her and thought I would share it, in case anyone else is in this situation. They are just transitioning into Waldorf so it's a little bit nontraditional (like the 6th grade geometry block being in there) and they will be ending with Farming & Gardening to transition into grade 3 over the summer and Chemistry & Nutrition to transition into grade 8. Don't forget that there are plenty of Waldorf books available as PDFs. This is due to the incredible generosity of the Online Waldorf Library. All ages from birth through high school are included in their selections. And, as someone who bought a LOT of these books, I can tell you it is many thousands of dollars worth of free content. Just realized, before I write about our first day of school, that I didn't finish my notes from our Measurement week over the summer! We finished our handmade books, our mini MLBs, with sections on calendars, clocks, temperature, mass, and volume. We estimated the mass of items in the house. The first child lined up a handful of items from lightest to heaviest, based on her predications. Then she weighed each item and wrote its name and its mass in grams on a sticky note. We arranged the sticky notes on the chalkboard from lightest to heaviest. Then the second child chose a new household item, compared it to the items already weighed, estimated its weight, wrote the name of the item and her estimate on a sticky note, then weighed it, wrote the mass on the note, and added it to our growing data table. They did this for a long time! I like to go over the metric stair using the story of LaGrange, ("The Professor Who Did Not Know") from Mathematicians Are People, Too: Stories from the Lives of Great Mathematicians, volume 1. I bought this book on September 2, 2006, according to Amazon, and I have used it countless times since then. I love the image of LaGrange just quietly suggesting from the back of the room that a system with increases and decreases of a decimal place (multiplied by ten, divided by ten) would be so much simpler than multiplying or dividing the base unit by 12! Nothing against the ancient Babylonians, of course. It is also fun to line containers up by predictions of capacity, then checking by filling them with water or rice (water is more fun) and then rearranging. You can do this with a collection of vases or bottles and jars, but I LOVE my Power Solids! I've had these for over 15 years and they are still holding up with nary a crack. Would you measure a horse in grams? A kilogram's the way to go! What do you use to weigh a horse? You use kilograms of course! And I thought they could jump and form their bodies into a K. This was silly and fun and I share it in case it works for you!